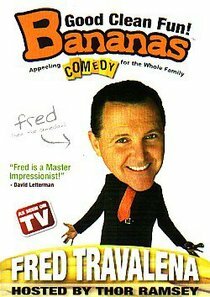 This episode of the hit TV show BANANAS features veteran impressionist and stand-up comedian Fred Travalena. From Dr. Phil to Lawrence Welk, Richard Nixon and Ronald Reagan, you'll be amazed as Fred morphs from character to character without batting an eye! BANANAS is more than just stand up, it's hilarious interviews and unscripted moments caught on tape. Laugh along as Fred sings, dances and brings to life some of your favorite celebrities. There are so many characters in Fred's head, you won't want to miss a single one! This is one episode of BANANAS you will savor over and over again. Best of all, it's good clean fun for the entire family. About "Bananas Featuring Fred Travalena"